Summer crafting in my house means involving the kiddos. With the warm weather here, we are outdoors at lot. My girls love sitting in the grass for picnics, playing games on the lawn, and enjoying a popsicle on the front yard. With all of that time in the grass, my girls needed somewhere comfy to sit. So we revived an old craft from my days as a Girl Scout and decided to make 'sit upons'! I found a great tutorial for inspiration and then went from there. 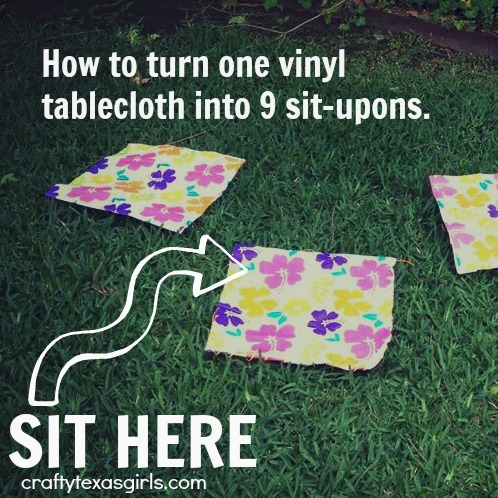 I let my girls choose a laminated table cloth and colored plastic cording. It's always interesting to me to see what colors/patterns they prefer. Could this table cloth be any more 'summer'??! We used a 54"x 90"tablecloth from our local party store. 1.) 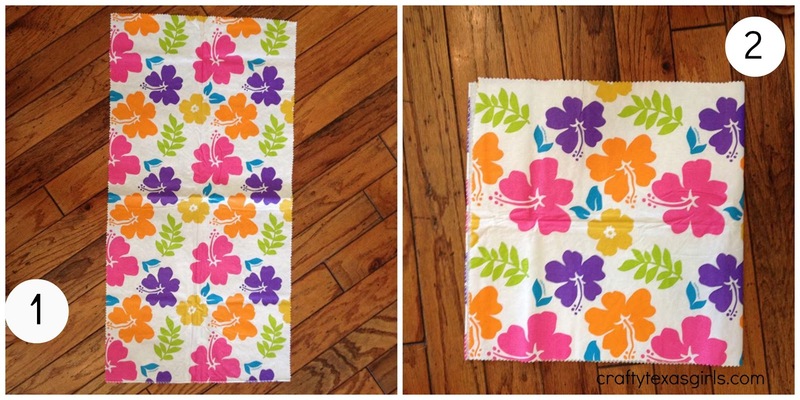 I cut the tablecloth into 15"x 30" rectangles. 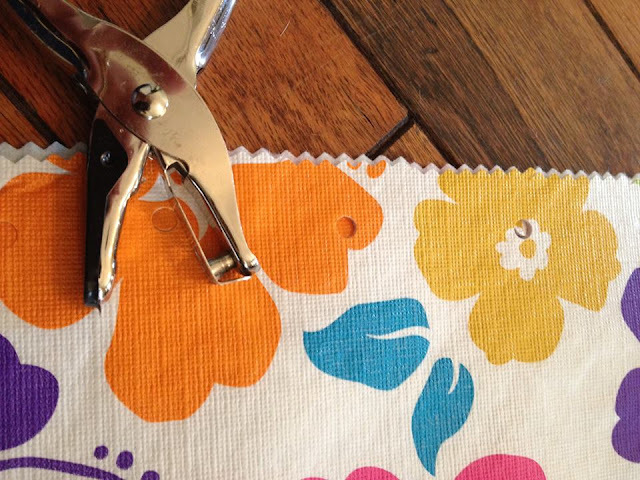 You can discard the edges of the table cloth-- see this site for an image of how to cut. The pinking shears make for nice edges. 2.) We folded the rectangles in half to form 15"x15" squares. 3. ) I punched holes about every inch or so around the three open sides. 4.) The girls sewed two sides of the sit upons using plastic cording. 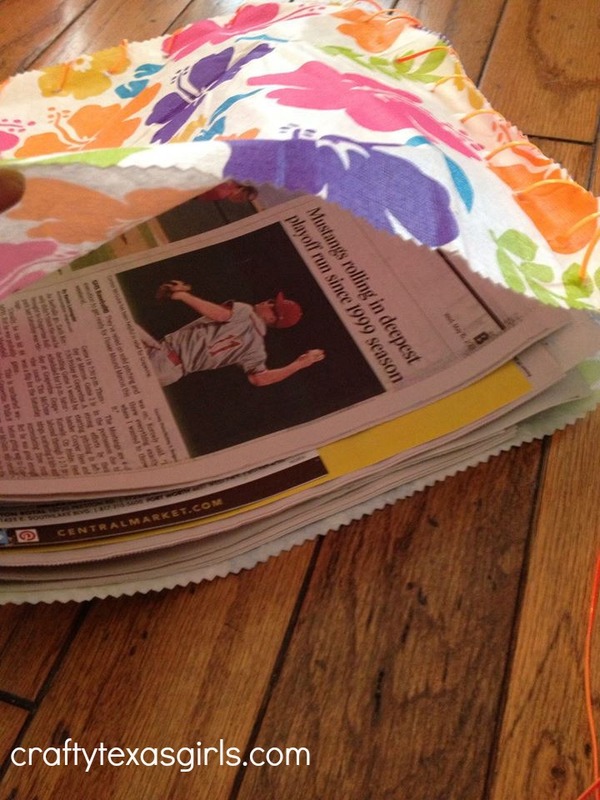 We gathered 13"x13"stacks of newspaper to fill the sit upons. You could also use foam, carpet, or even egg crate. 5.) They filled the sit upons with the newspaper and then sewed the third side closed and tied the cording in a knot. (By folding the table cloth, one of your sides will already be closed.) 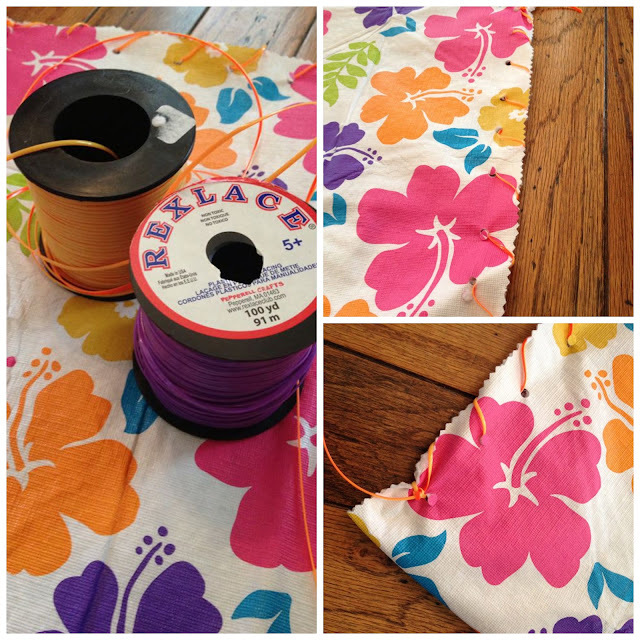 Make sure not to pull the cording too tight otherwise the table cloth will bunch. My girls wrote their names in Sharpie on the backs so we could tell them apart. We have loved using them outside, but you can also use them inside. It's nice to have a soft spot to sit. We shared our craft with our Girl Scout troop. The first grade girls were all able to complete this activity almost all by themselves. You could also use these for story time, time out, musical chairs etc. The 'sewing' portion of this craft is a good skill for any kid. It teaches eye-hand coordination, patience, and pattern recognition. Boys and girls can make their own special place to sit. 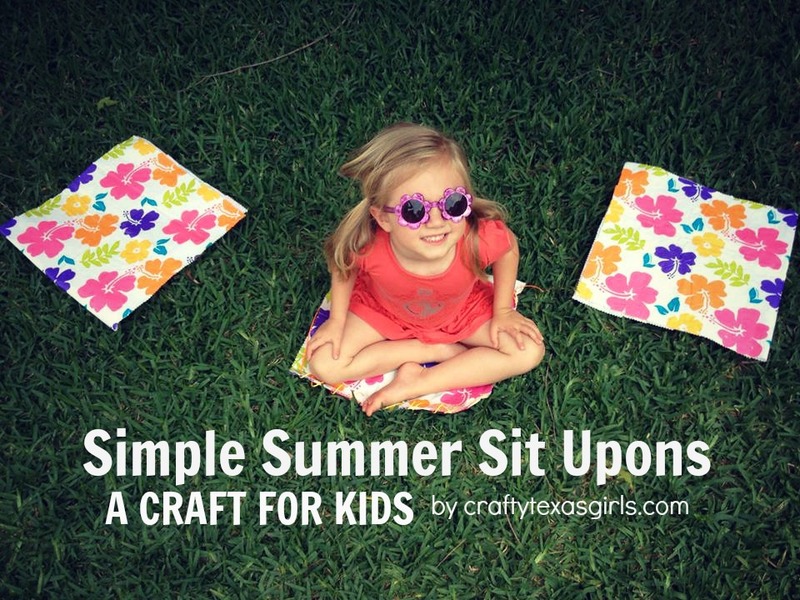 So there you have it, a fun summery craft for you to create with your kiddos! What would you and your kids use a sit upon for? I am sharing this post as part of our Summer Celebration Series. Have you been following along? Be sure to see out yesterday's post featuring Vintage Patriotic Decor from The Golden Sycamore. And tomorrow, The Wood Grain cottage has a great summer project to share too. Go check her out! How clever are these cute things, Samantha! "Sit-upons" Love them! 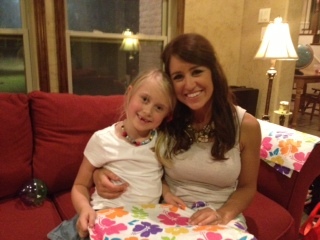 And I love how you incorporated your girls into the making of them - what a fun summer project! Thanks so much for sharing! We NEED these for football games. Chair are very expensive and these are new-sew and right in the budget. Thank you for sharing!